I am almost 50 years of age and have been cooking since I was just a child. I come from a long line of outstanding cooks in my family. Like the cooks in my family I never work from a recipe. It,s like my grandma would say when I asked her how she made something. She would push her eye glasses up off the edge of her nose and say " Ah a little bit of this and a little bit of that" But since the invention of computers it has allowed me the privileged to document the dishes I create. In the same manor as those before me a little of this and a little of that. That is exactly how I came up with Fettuccine Rustica. I know have even documented some old family recopies that have been handed down from generation to generation. To be honest with you I am catching a lot of heat from my feisty little Italian American Mother.She yells at me that I am letting out all the family secrets. I try to explain to her that some of these dishes are so delicious they should be shared with the world. So she pushes her glasses up from the edge of her nose and says dfghjkl;op[ if you get my drift. Salt and pepper the chicken then sear it in a heavy pot or large skillet.You want to just under cook the chicken then remove and set aside. Then add the mushrooms first let saute about 5 minutes on a medium heat then add the onions & sliced sun dried tomatoes with a little salt and pepper. Allow everything to clarify and soften about 15 minutes then put in the garlic and minced herbs. Constantly turning the mixture not to let the garlic burn. If you take the leafs of rosemary and oregano and wrap them in basil it a lot easier to mince. After about 5 minutes add the white wine and reduce to about 1/3 then add the broth and bring to a simmer. 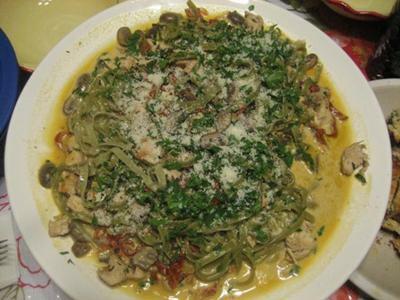 Then add the chicken if you are using dried pasta now add the heavy cream and lightly simmer. You should have a pot of boiling water ready salt it and add the pasta if fresh pasta only about a 1½ minutes if dried pasta about 6 to 7 minutes. If you are using dried pasta wait until you add the pasta to the water before you add the heavy cream to the sauce. Under cook the pasta and strain it leaving about 1 cup of the starchy water with the pasta. Then add the pasta to the sauce with about 1/4 cup of grated cheese and allow it to reach the desired texture put into a pasta bowl add serve.